Experience the life of a bounty hunter, hired out for the most dangerous jobs. Then experience repetitive gameplay and very strategically placed microtransactions after the tutorial. Dungeon Hunter 5 is an average RPG when you're sitting at home but if you don't have a data connection, you can't play. 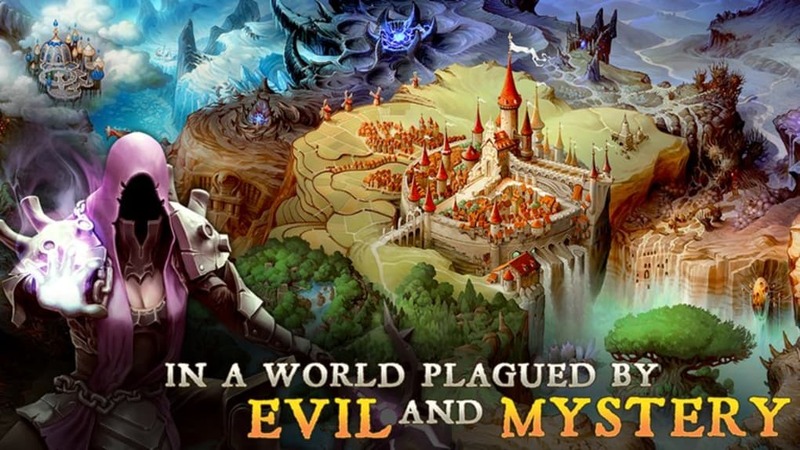 Dungeon Hunter 5 uses the same mission styles as many casual games. You are limited to following a linear story as the leader of a bounty hunter group and missions range from assassinations to rescuing important people. There's "variety" in that there are different missions, but they all play the same way. You can pick up dropped weapons, armor, and money which can be used to upgrade your equipment. You can't actually buy anything so you're stuck to finding it while playing. At the end of each level, you earn different equipment cards. Weapons and armor have different elemental properties like fire and water that can be beneficial during specific missions. 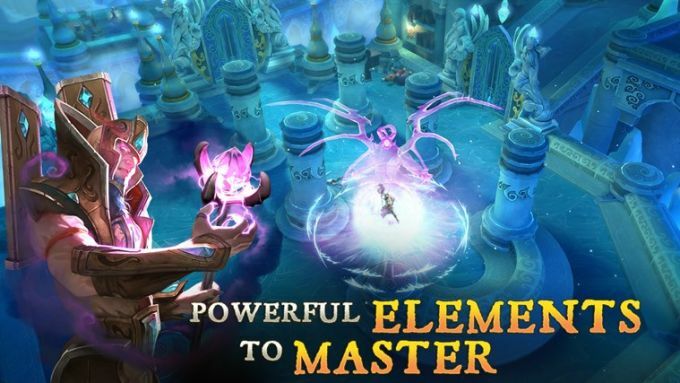 Dungeon Hunter 5 suggests what element will work best before starting a quest. Equipment features two upgrade schemes: Fusion, where you break down unequipped weapons and armor and fuse them to increase its stats and Evolution for direct weapon upgrades, but these require really rare items. 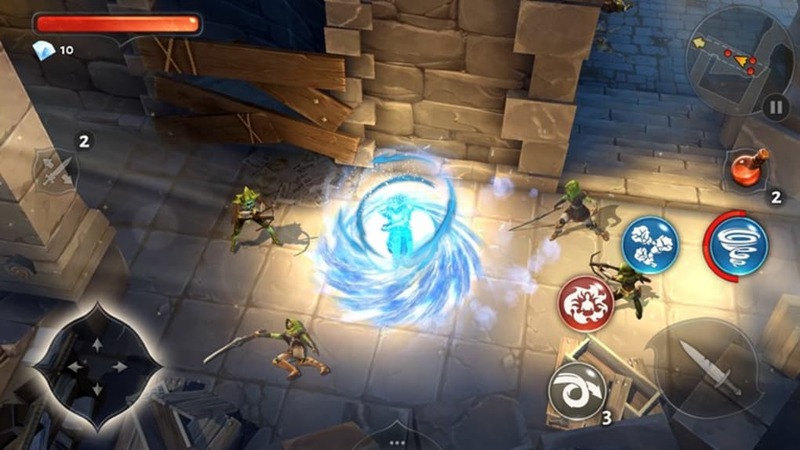 Movement in Dungeon Hunter 5 uses a free-floating directional pad and combat controls are a set of on-screen buttons. The basic attack uses your equipped weapon, but you also have access to spells and defense magic if you have the right equipment. Combat is repetitive. You wander around the level fighting lower level minions before getting to a level boss. When you defeat a boss, you open a chest which contains equipment cards and XP. There's not any real strategy involved when fighting, even with different weapon classes, because everything feels overly simplified. You can hire another player to join you in missions adding a helping hand for stronger enemies, but the AI is pretty bad. They basically act as damage sponges for stronger enemies until they die. 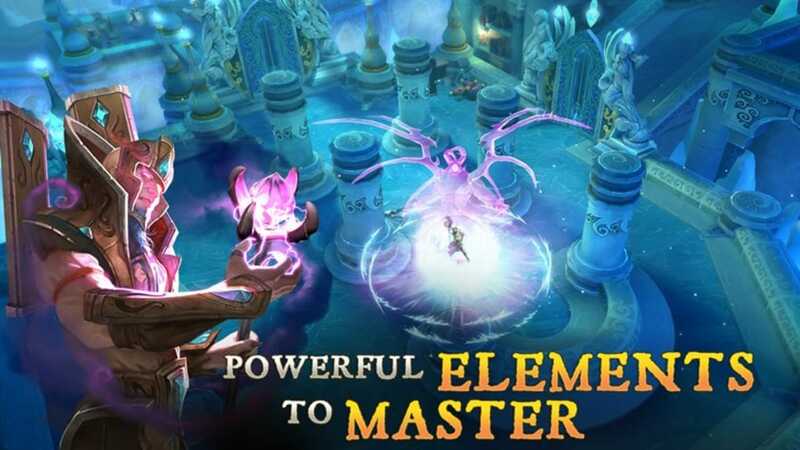 Dungeon Hunter 5 also has in-app purchases for gems. Gems are used to open random chests in the home world, upgrade your character's inventory slots, and refill different stats. There's no item or equipment store in Dungeon Hunter 5 so you have to pick up everything while playing. One really annoying gameplay element is that you have to buy health potions with gems. Since gems are the premium currency, this means you may get stuck in a loop of not being able to complete missions because you need health potions but don't want to spend actual money. On the surface, Dungeon Hunter 5 appears like a vast and epic game. The voice acting is pretty good and it creates a world that feels lived in. The problem is that gameplay is boring. Regardless of being a ranged or melee type of character, there aren't many combat actions to complete. It's more interesting to play a melee character because ranged characters stay back from combat. The camera is also problematic. Dungeon Hunter 5 uses a fixed camera angle that follows as you move through the level. The problem is that enemies can spawn from off the screen and attack without you being able to see them. 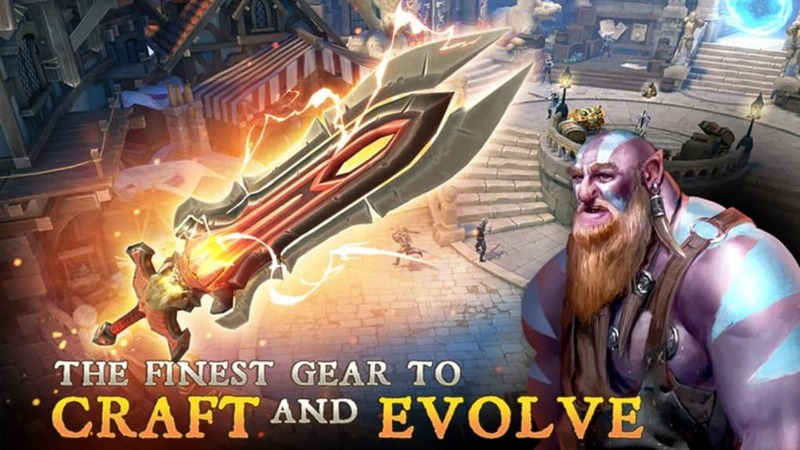 It's also apparent that during the early tutorial levels, Dungeon Hunter 5 makes the game easy. Even at level one, you can quickly defeat enemies. But by mission five, enemies are stronger than you and come in large groups. The control scheme doesn't make it easy to escape and getting surrounded happens a lot. Since Dungeon Hunter 5 requires gems to buy health potions (aside from the free ones given to you at the beginning), it is forcing you to buy gems to grind certain levels. Even though Dungeon Hunter 5 gives you four gems at the end of each level, health potions cost seven gems. This means you have to complete two levels to use one health potion. 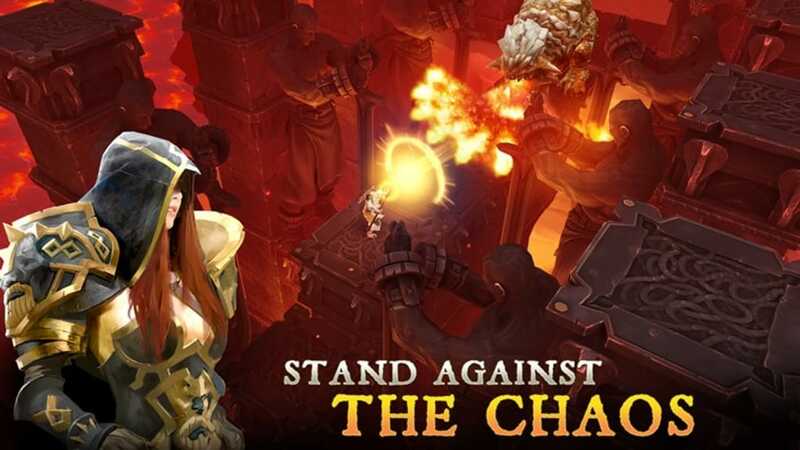 Dungeon Hunter 5 also requires an active data connection to play so if you're not on Wi-Fi or using an smartphone, you can't play. Having an offline mode would make the game much more enjoyable than waiting for the game to load between every single menu. The game scales to different devices but if you have an older PC you're going to have laggy and average graphics. The best graphics will only be available on the newest devices. Dungeon Hunter 5 could have be a great game. It's designed for short gameplay sessions but like most mobile games that use pushy microtransactions, you can only make it so far before you're forced to pay. The game features interesting mechanics like Fusion and Evolution, but the lack of a store to spend all the gold you earn makes gold useless. Combat is solid, even if very repetitive but Dungeon Hunter 5's lack of strategy will leave RPG fans disappointed. The biggest problem with Dungeon Hunter 5 is that it requires a data connection to do anything. It forces you to play the game in very specific circumstances and the interface isn't made for phones. 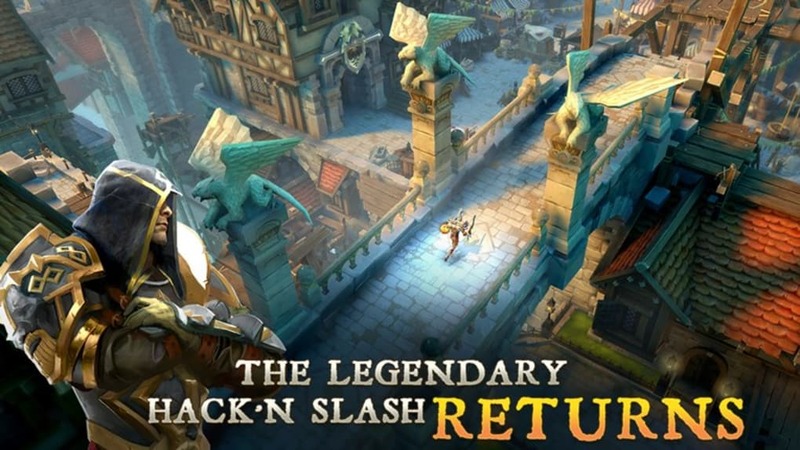 If you played previous Dungeon Hunter games, then you will likely enjoy this sequel. Newcomers should look elsewhere for a real RPG experience. What do you think about Dungeon Hunter 5 for Windows 10? Do you recommend it? Why?